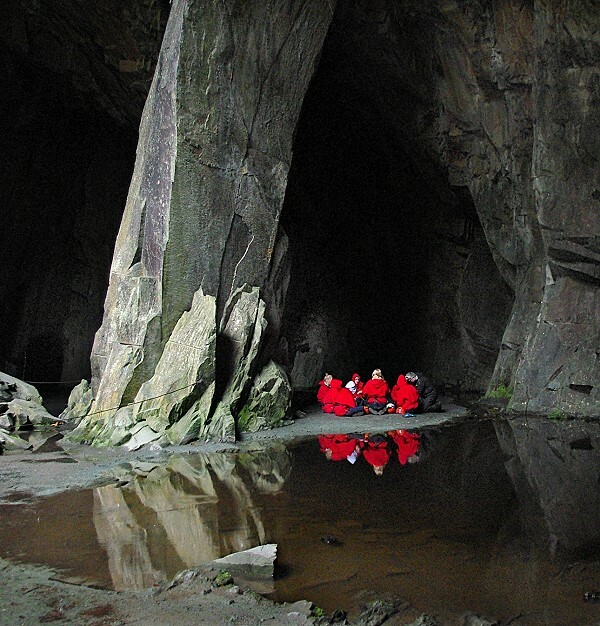 Stephen Dutch Photography: Caving for beginners. Whilst walking in the Lake District, I decided to call in at one of my favourite haunts, I hadn't been for a while and I was missing the old place. There had been a lot of rain recently and the cave entrance had a lot of water in the tunnel down to this open cavern, and everywhere, the sound of dripping water could be heard even though it wasn't raining. As I approached the central pillar I had to pass this group of young ladies, sat in a circle on the floor, receiving some kind of tuition. I thought nothing of it, apart from the fact that they were all in red. I went to the back entrance of the cavern with the intention of ascending the small rock face to go through the tunnel but thought better of it as it was extremely damp with wet mossy rocks, so I returned to the cavern and then saw this reflection in the pool nearby.